To quickly see all of Today's Teams go to your Sports Calendar in either the SOCS control panel or dedicated sports website and click the Today's Teams button indicated in the screen shot below. 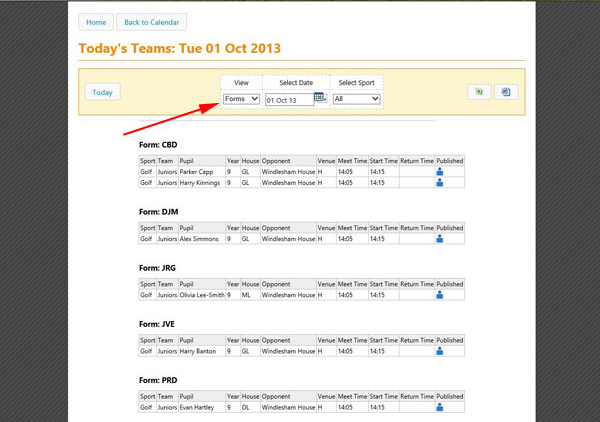 The Today's Teams button is only visible in the sports calendar if the school has the Team Sheet Builder component. 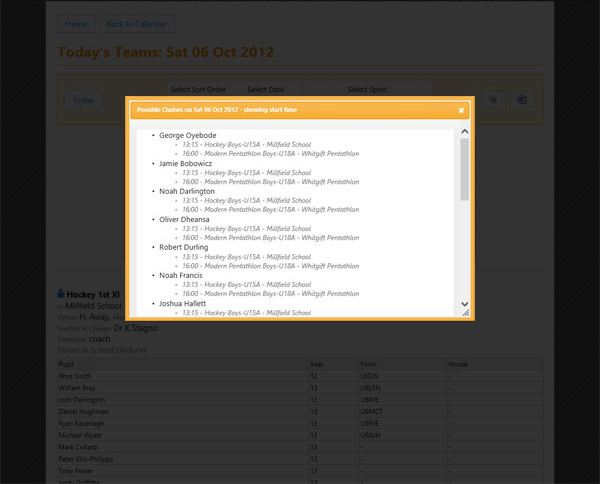 All published and non-published teams for the day selected are shown on the Today’s Teams page. If the school has included Form and House allocations for each pupil when submitting pupil list updates then Todays Teams can be viewed to show Forms or Houses in addition to the usual Team view. To change the view use the View drop down list (see screen shot 3). These views are useful for House and Form staff wishing to see at a glance which pupils have been selected from their House or Form. The listings can be exported to Word and Excel. In the default sports team views only the Form and House data can be switched on/off when exporting to Word and Excel. If a school is not using the security module then only published sports teams are visible. Schools with the security module will see their sports teams as well as form and house views and any clashes. Note: this means house staff and form tutors do not need a FixturesPRO login account to see pupils in their respective house or forms selected for teams. 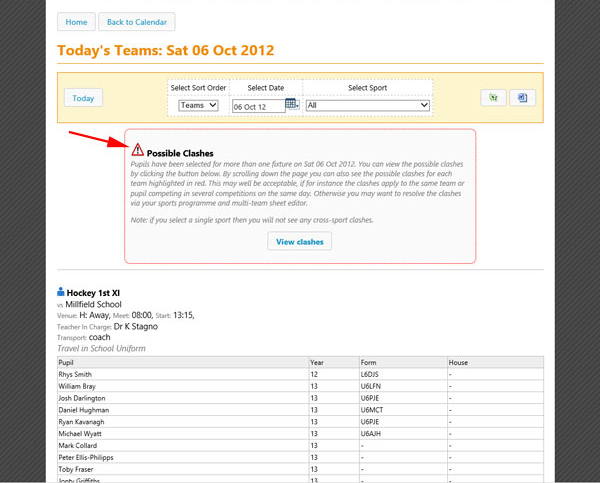 Schools with the security module can access the Today’s Teams page and export to Word or Excel. Note: The View drop down list will only function properly if schools have included form and house allocations when submitting their pupil updates. 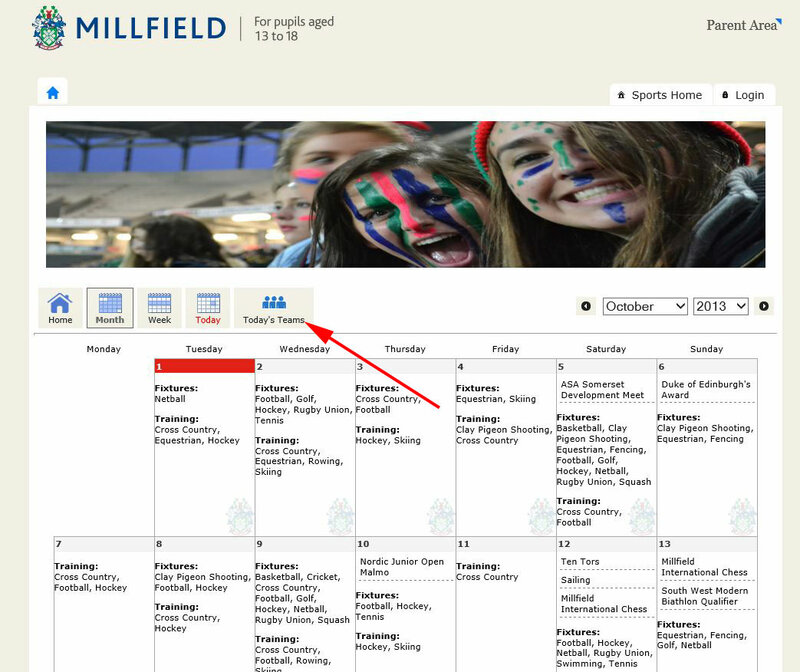 If form and house data have not been included then a message is displayed with a link to the pupil list instructions.